The Gremlin meets the masked man, Jason Foster! 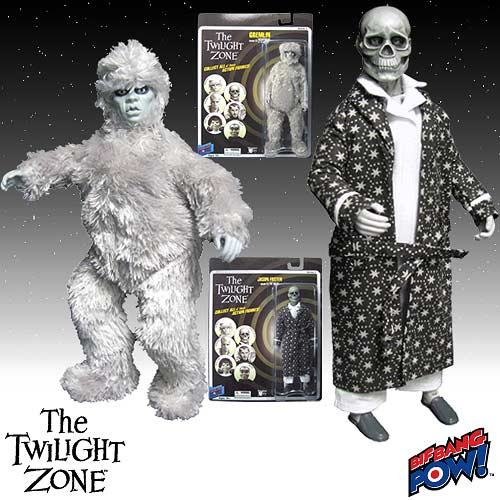 Classic characters from fan-favorite The Twilight Zone episodes. Set includes 2 spine-chilling black-and-white action figures from Bif Bang Pow! Retro 1970s styling with real fabric clothing! Faithful followers of the iconic The Twilight Zone TV series have reason to rejoice. Bif Bang Pow! brings an astonishing assortment of fully articulated, 8-inch tall action figures to your table. Each exceptional character features real fabric clothing and a retro design that's sure to please fans of the most popular action figures of the 1970s. Each comes individually carded in blister packaging. Ages 14 and up. The Gremlin is from that terrifying "Nightmare at 20,000 Feet" episode of The Twilight Zone. You'll be having nightmares yourself if you let this creepy character get away from you! An eerie robe-clad visage right out of the 1964 episode entitled "The Masks," this spine-chilling action figure of Jason Foster is sure to set the proper mood for your next Mardi Gras eve get-together!